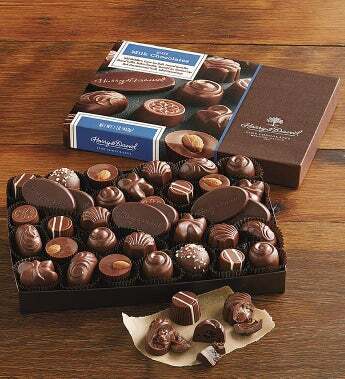 Thrill a lucky friend or loved one with a beautiful gift box filled with just over three-dozen milk chocolates. Each of these chocolates is crafted in Harry & David's candy kitchen using the finest ingredients. From solid milk chocolate medallions to pieces filled with salted caramel, hazelnut, almond, and caramel, there are chocolate delights here to please one and all.